This is a great appetiser to serve with drinks when your guests arrive. Place the peas in a large bowl and cover with boiling water from the kettle. Leave to stand for a minute, then drain in a colander. Heat the olive oil in a small frying pan and gently cook the shallots for 2-3 minutes until beginning to soften. Stir in the ground cumin, sesame seeds and chilli, and cook for a further 2-3 minutes. Place the shallot mixture in a food processor with the drained peas and blitz for a few seconds until coarsely ground. Add the coriander and egg, and blitz again until evenly combined. The mixture should resemble a thick, coarse paste. Stir in the breadcrumbs and season. Take teaspoons of the mixture and, with floured hands, shape them into 24 small balls, then flatten them slightly into discs. Gently heat about 2cm of vegetable oil in a deep-sided frying pan. Drop a little of the mixture into the oil to test if it is hot enough. If it sizzles and browns, the oil is ready. Cook the falafel in 2-3 batches. Fry them in the oil for just 1 minute on each side, until golden and crispy on the outside. Remove with a slotted spoon, drain on kitchen paper and leave to cool. Place the cold falafel in a single layer on a baking tray and cover with clingfilm. For the dip, simply stir the harissa paste into the yogurt, spoon into a small bowl and cover with clingfilm. Preheat the oven to 200°C, gas mark 6. Remove the clingfilm from the baking tray and heat the falafel in the oven for 5 minutes or until warmed through. Place on a platter and serve straight away with the dip. 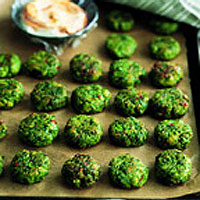 This falafel mix is just as tasty made with frozen broad beans. It takes a bit longer as you need to remove the skins from the broad beans before processing, but it is worth it for the colour and flavour. Serving falafel as an appetiser, provides the perfect excuse to start everyone off with some fizz.